Very few problems in life can’t be solved through boatloads of money being thrown at them. Autonomous driving could be one of them. 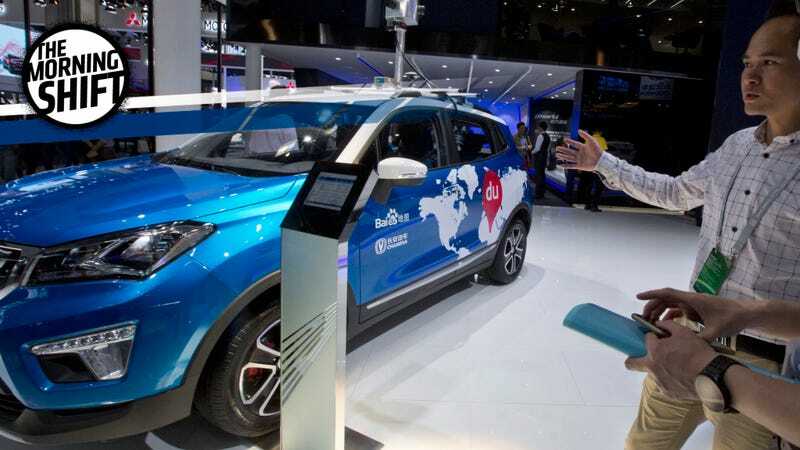 Baidu, the largest search engine in China, announced today that it would invest 10 billion yuan ($1.52 billion) in 100 autonomous driving projects over the course of the next three years, according to Reuters. Named the “Apollo Fund,” this move is part of Baidu’s larger plan to accelerate development and compete with American opponents like Google and Apple. In April, Baidu open-sourced its software—again, in the hopes that it would help speed up the autonomous driving developments. This kind of competition is good! Competition breeds innovation. And while Baidu’s goal of having a self-driving car in production by next year seems ambitious, perhaps hoping for new autonomous driving discoveries within the near future isn’t. Vehicle-to-vehicle communication systems are what would allow cars to effectively “talk” to each other. And because all the cars would be in sync, they would all be on the same page in regards to collisions or obstacles in the road. Overall traffic congestion would decrease, as well as road fatalities. Seems like a good thing that should get mandated, right? Despite its promise, the tech is going nowhere fast. A push by regulators during the Obama administration to speed V2V to market has stalled under the Trump administration. Without rules requiring it, automakers including Ford Motor Co.are holding off on deploying $350-per-vehicle systems that aren’t effective unless most cars have it. While the race for autonomous cars is still very much on, the cars that tout such capabilities will still only be guided by sensors. They won’t be able to communicate with each other or the environment. Personally, I don’t think vehicle safety is a zero-sum game. I don’t see why you can’t have both. Meanwhile, the Bloomberg story is excellent and you should go read the rest of it. 3rd Gear: Does That Make Them Pirates? According to Merriam-Webster’s definition of “piracy,” which is, “an act of robbery on the high seas; also: an act resembling such robbery,” then what environmental activist group Greenpeace did wasn’t technically piracy—there was no robbery. But as it stands, they did board a cargo ship in an attempt to keep people on the other end from receiving the goods it was carrying. Here’s what happened, as Reuters reports it: activists, using kayaks and boats, boarded a ship in the Thames Estuary that was carrying Volkswagen diesel cars from Germany to be unloaded at the southeastern port of Sheerness in Kent. Once aboard, they attempted to stop the unloading process. Others broke into a vehicle park at Sheerness where they were sticking labels on engines and attempting to immobilize cars by taking the keys, the environmental pressure group said. Britain already has a pretty aggressive stance on diesel cars—it has said that it will ban all diesels and gasoline-driven cars by 2040. But that’s not soon enough for some Greenpeace activists. “Diesel cars are toxic – so we’re here to block VW imports on behalf of all of the children who are the most acutely affected by the health impacts,” said 38-year old Janet Barker, who took part in the protest, in a statement. “The government says we need to wait another 23 years for dirty diesels to be banned. We can’t wait that long,” she added. When the government doesn’t move fast enough for you, you take matters into your own hands, I guess. You’ve seen Angelina Jolie and Brad Pitt’s Mr. & Mrs. Smith, right? I ask because one of the standout moments from that stupid movie was the minivan chase scene. Many people saw that movie. Perhaps many people who also drive minivans. The automaker says that during sporting driving, the center buckle could hit the release button on the left buckle and cause it to unlatch. The company says it doesn’t know of any crashes or injuries from the problem. It says in documents posted Wednesday by the U.S. National Highway Traffic Safety Administration [found here] that dealers will install a shorter second-row seat belt buckle in a recall that is expected to begin on Oct. 20. What the Associated Press story lacks, however, are specifics. What exactly is meant by “sporting driving”? Slaloms around shopping carts at the local supermarket? Drifting through a Costco during after hours? Going ten-tenths on the way to soccer practice? I joke. I’m glad that FCA caught this before anyone got hurt. But if you have a new Pacifica, maybe don’t engage in a high speed highway shootout until you get this fixed. A powerful draw that many people take into consideration when buying an electric car is all of the incentives that come along with them. In the U.S., that comes in the form of considerable tax credits (although that’s poised to taper off soon). Because these incentives were necessary. The technology in electric cars is expensive. Some have limited ranges and lengthy charging times. And with so many countries (including India, France, Britain and Norway) looking to ban gasoline cars in the coming years, electric car tech is going to need to get cheap. The industry cannot survive on incentives alone. But as the technology advances and improves, it likely will also drop in cost and increase in performance. Which means that people won’t need those tax credits and whatnot anymore—they’ll buy the car because it makes financial sense. Neutral: If you don’t have one already, what’s keeping you from buying an electric car?